Ada's Single Halo Lab Grown Diamond Engagement Ring surrounds your center stone with a halo of beautiful round lab diamonds. Available options: platinum, 14k or 18k gold: white, yellow, rose. Each of Ada's bridal pieces are fully bespoke and made to your specifications. Make your dream ring come to life with our 21st century custom design process and conflict-free cultured diamonds. Ada Diamonds Design Description- Lift your stone and add a touch of sparkle with a single halo of round lab diamonds to enhance the size of your center stone! Shown with a round center stone. Customize your ring with band widths from 1.8-3.5mm, in a rounded comfort fit or knife edge style. 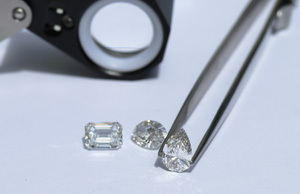 Starting at price assumes DEF/VS lab grown diamonds set in 18k gold. Platinum available for an additional $300 fee.